Android news tends to focus on the flagship phones from the largest companies, if only because they inform the direction of phone design for the following year or so. But it's important to remember that giant corporations like LG release dozens of new models in the same timeframe. The first two LG phones announced for 2016 are the K7 and K10, both being revealed before the enormous Consumer Electronics Show (which doesn't technically begin until Wednesday). Both phones are quite few steps down from flagships, but noticeably above the entry level, much like the older L series that they're based on. The K10 uses a 5-inch HD (read: probably 720p) LCD screen and a 2300mAh battery, but the rest of the specs vary based on which particular phone you're using. 3G and LTE versions will be available, and depending on which you choose, the RAM will vary from 1 to 1.5 to 2GB, and you might get a 1.2GHz quad-core processor, or a 1.3GHz quad-core, or a 1.14GHz octa-core, with no specific model revealed (probably mid-range Qualcomm chips). Storage is 8GB or 16GB, and the cameras are 8MP for the 3G version and 13MP for the LTE version... at least on the rear. Some models of both 3G and LTE phones will have 5MP front cameras, while some will get 8MP. Why are all these different configurations under the same name? The smaller and presumably cheaper K7 is similarly ambiguous. The LTE version gets a 1.1GHz octa-core processor, 1.5GB of RAM, and an 8MP rear camera. 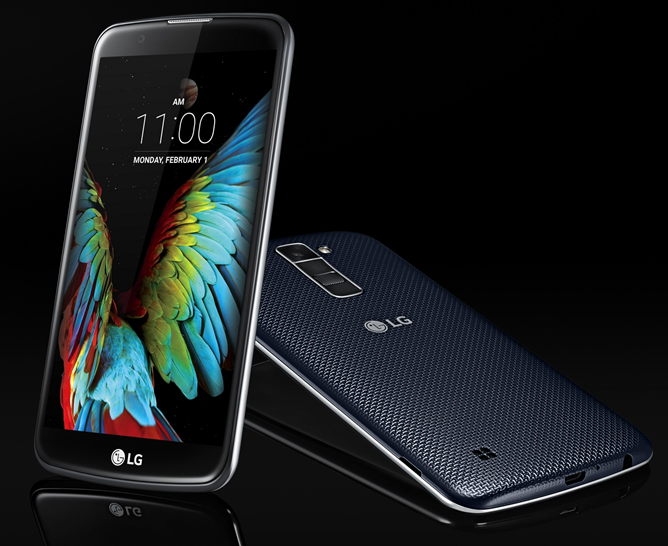 The 3G model settles for a 1.3GHz quad-core chip, 1GB of RAM, and 5MP on the rear camera. Both of them have a 5-inch 854x480 screen, a 2125mAh battery, a 5MP front-facing cam, and there are options for 8GB or 16GB of storage. There's no mention of expansion for either. The K10 will be available in white, indigo, and gold colors for all versions, but the K7 LTE comes only in "Titan" (what?) while the 3G version will be available in white, black, or gold. Both phones have a unique and rather fetching cross-hatch pattern on the rear plastic, sort of like the DROID Turbo, but more pronounced. They also feature LG's standard rear control buttons, with the power button and volume up and down hanging out beneath the camera module. LG says that the K series uses "2.5D Arc Glass," without precisely explaining what it actually is - presumably the glass, if not the screen itself, has a gentle curve to it. Both phones run Android 5.1 with LG's myriad software add-ons, including the ability to take a selfie with a fist gesture. There's no mention of price or release date, but expect to see them pop up in Europe and Asia before too long, with perhaps a few American carriers grabbing them towards the middle of the year.